Civic Series events are free, though they do cost money to run. Donate to support us in maintaining the Civic Series' website, thanking our speakers, and helping us grow to other cities. 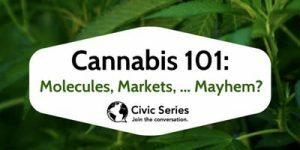 Share Cannabis 101: Molecules, Markets, … Mayhem?